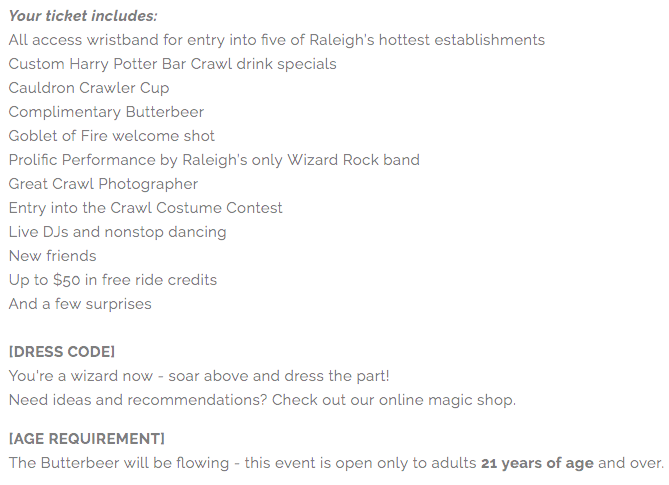 A slew of angry, negative reviews have flooded the Facebook page for a Harry Potter–themed bar crawl called "Wizard & Wand" after attendees were left less than impressed with the event in Raleigh, North Carolina, over the weekend. The themed bar crawl, coordinated by a company called Great Crawl Events, was held in downtown Raleigh on Saturday. It was formally scheduled between 3:00 p.m. and 9:00 p.m., with after-party events that followed. Early bird ticket sales were $15, but as the event neared, tickets were being sold for upward of $40. Days before the event, organizers boasted of 5,000 ticket sales and "potentially drawing tens of thousands with massive economic impact," a Facebook press release stated. Great Crawl Events told BuzzFeed News the final headcount on the day of the event was 3,300. "It was the largest private event [downtown Raleigh] has ever seen," one of the main organizers, Zack Medford, added. Unfortunately, after the day unfolded, many attendants and Harry Potter enthusiasts were left unsatisfied and upset. One of the initial complaints, even before the event, was that a "Hogwarts Scarf" included in the initial ticket sale package was retracted from the offer. Medford told BuzzFeed News the vendor that was supplying the scarf "fell through," citing that "they weren't able to get them shipped from China" in time. People who purchased tickets, however, claim they were never directly informed of this change of plans. Multiple people cited a lack of clarity about the scarf in reviews on the Facebook page, and three people who purchased tickets told BuzzFeed News they never saw an announcement of any kind that the scarf was no longer a part of the package they'd already paid for. "They never communicated that they changed their mind, they just 'updated' the description in the event without telling anyone," Christina Robbins, 28, said. Robbins and others said they only noticed the scarf was omitted from the event description as they were checking their tickets leading up to the day of the event. In an effort to compensate for the scarf, Medford gave out handmade wands instead on the day of the event. People were dismayed with the wand, which many people described as "a chopstick dipped in wax." The event also promised a plastic "Cauldron Crawler Cup," which many said left a lot to be desired. "We received a chopstick dipped in wax deemed as a 'wand' and a plastic cup deemed as the 'swag' we paid for," Erin Frye, 26, told BuzzFeed News. She, among others, deemed the items "false advertising." "It’s obvious they let the event go over their heads," another attendant, Matthew E., said. Medford pushed back on the criticisms of the wand, and said "my wife and I stayed up at night handcrafting those wands." He added that he believed the event was "never about the swag — it was about coming together with Harry Potter fans." 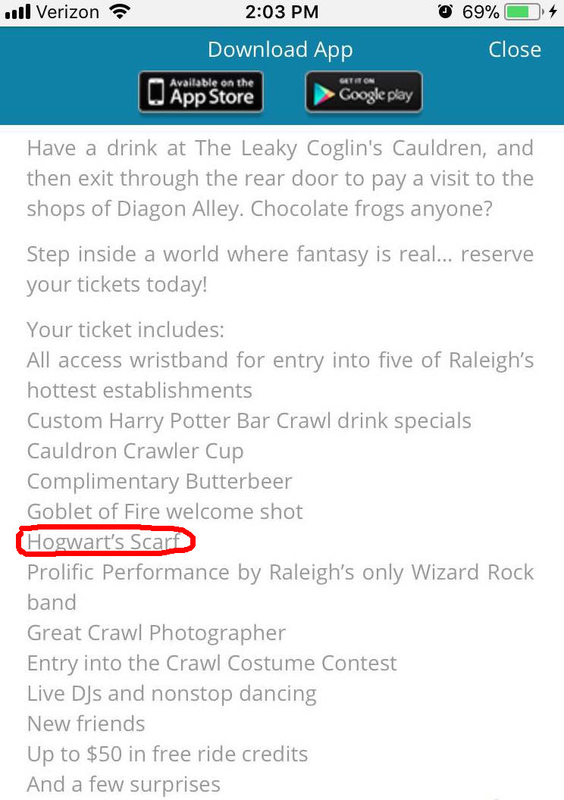 The "Goblet of Fire welcome shot" and "Complimentary Butterbeer" cited in the event description were also disappointing for some. Frye told BuzzFeed News one of the drinks tasted "like Kool-Aid" and "the Butterbeer" came in a small cup the size "of one you got at the dentist." Frye said she and her sister, who attended the event with her, followed instructions and went to the bars where the two drinks that came with their tickets were being served. "The [Goblet of Fire] welcome shot was this colored drink...I got blue, my sister got red. It tasted like Kool-Aid, and didn't taste like much alcohol was in it," Frye said. She then described the small amount of "Butterbeer" as "some sort of syrup stuff." However, the biggest, and most unanimous complaint, was the lines at every bar, which left people outside for much of the event. 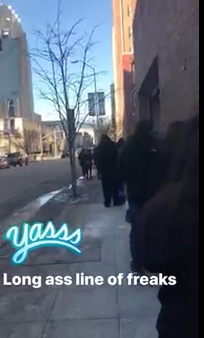 People said there was also a massive line to check in. They clocked their wait times at 1.5 to 2 hours. Frye said when she arrived at 3:30 Saturday, there was already a line "that wrapped around the block three times over." It was close to 5:30 when she got to the front table, but no one actually checked her ticket. "They should have cut off ticket sales at some point," Robbins said. "They got greedy and saw the numbers piling up. 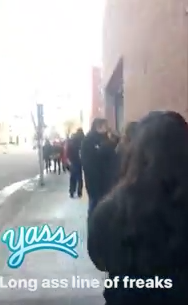 They knew they didn't plan for this amount of people and still continued to push tickets at the door." Frye said after waiting in lines for her drinks, she left at around 7:30. "A handful of people missed the idea that it's a bar crawl — the point is to bounce around at different bars," Medford said in response to these complaints. He said he's aware of the negative feedback as "the Harry Potter fanbase is a very vocal fanbase." But he claimed he and his staff of 50 scattered throughout the bar crawl "didn't have a lot of complaints at the event itself." Some people are so disappointed and angered by the event they're calling it a "scam." A handful of people made allusions to the infamous Fyre Festival incident last year. Some attendees are asking for full refunds, and others are calling the event a rip-off. "I don't believe the $40 can be justified given the swag was just a stick with wax." Not only is the organization not issuing any refunds according to Medford, someone running the Wizard & Wand Facebook page began responding to the complaints facetiously. Medford said the snarky responses were by a "rogue employee" of the event who's since had their "privileges revoked." He said this employee was simply "exhausted after putting together what we thought was an incredible event." "Not having people tell us or complain to us at the events — there were 50 people wearing staff badges, we're not issuing refunds," he stated. However, he said he does "want to make things better" for events that follow. Despite the backlash, Medford believes he and the other employees put on "an awesome event." He said "there were thousands of people that had a blast — every one of them was like, 'This was amazing.'" "A handful of people misunderstood what a bar crawl was," he added. "I wish they would have approached us during the event." Medford is quite optimistic about similar Harry Potter-themed bar crawls in the future. "Next year it's going to be bigger and better; we'll expand registration and cut down on wait times."